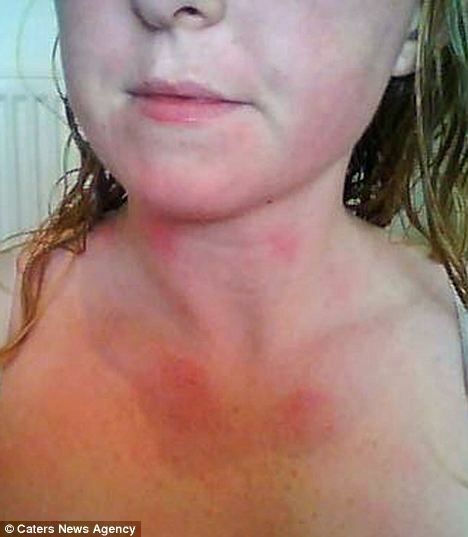 A young woman whose life is blighted by an allergy to water has told how she can’t even watch a weepy film, because her own tears bring her out in a painful rash. Katie Dell, 26, is one of only about 35 people in the world diagnosed with the rare allergy aquagenic urticaria. It means she can’t have long soaks in the bath, go swimming, or cry without triggering a burning rash on her skin. But she can’t get upset and cry – because her tears also cause a painful reaction on her face. Katie said: ‘I can’t even watch a weepy rom-com film like most girls and I’ve missed out on a lot of the classics like E.T and The Notebook. ‘If I feel I’m going to cry, I turn it off and I’ve missed the end to so many films. ‘Symptoms began after I had my tonsils out when I was about 16. The condition is so rare that doctors thought at first that Katie was making it up. She said: ‘By the time I reached 20, it was at the point I wanted to dig my nails into my skin. 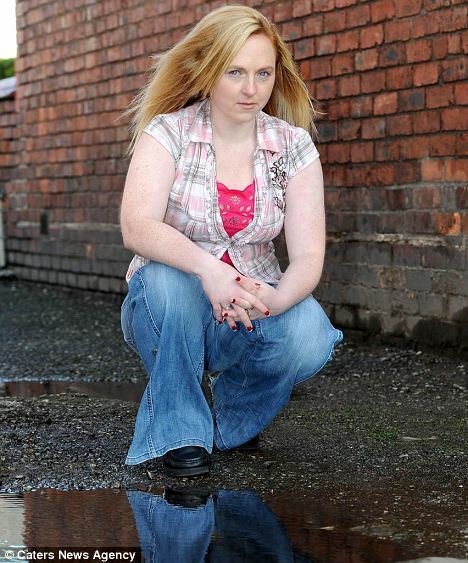 It was only when she moved from Suffolk to Flint two years ago that Katie finally got a diagnosis. Her new GP thought it was Aquagenic urticaria and referred her to a specialist. She was diagnosed by a dermatology specialist at Glan Clwyd Hospital in October this year. She said: ‘I thought I had been allergic to chemicals and I changed my soap, shampoo and conditioner. ‘I looked on the net and found people with a similar condition called perusis so I changed my diet, started taking hayfever tablets, putting soda in the bath, even trying herbal remedies, but nothing worked. ‘I was glad when I got the diagnosis because I thought I was going mad. ‘The condition has, and will continue, to get progressively worse. ‘It started with an itchy neck. Now I have hives, a rash and painful, itching skin which can reduce me to tears, but I refuse to cry – well I try, as that affects me as well, leaving me with a red itchy face. ‘I do get quite depressed and I’m hooked on looking at the weather if I dare leave the house. She said: ‘I have to be really quick so Andy washes my hair and I wash my body. After, I can’t go anywhere for about two hours because it’s just too painful. ‘Andy is amazing – we have been together 11 years and he’s been fantastic about my condition. There is currently no cure for aquagenic urticaria and Katie says she has accepted that she is likely to have the condition for the rest of her life. She said: ‘Just thinking about the things I will miss in my life because of the rain, sweat or because I may cry, brings a tear to my eye but the most upsetting thing is that it’s progressive and I hate to think what it will be like in five years’ time if they don’t find a cure. ‘But I hate to be defeated so I refuse to cry and refuse to get down because life goes on. She said: ‘Aquagenic urticaria is a relatively rare condition. Urticaria is notoriously difficult to diagnose and symptoms include an itchy nettlerash (hives). ‘However, not all forms of urticaria have an allergic component, it could be caused by a physical reaction to things like heat or exercise. It is usually treated by a course of anti-histamines. ‘However, we would recommend the patient visits their GP for referral to a specialist dermatology or allergy clinic, in the first instance,’ she said.